Welcome to another edition of Constellation Friday! Today, we honor our dear friend and honored colleague, Tammy Plotner, by taking a look at the Aquila Constellation. Enjoy! In the 2nd century CE, Greek-Egyptian astronomer Claudius Ptolemaeus (aka. Ptolemy) released one of the most influential books in the history of astronomy. Known as the Almagest, this book included the 48 then-known constellation into a system of cosmology that would remain influential for over a thousand years. Among the 48 constellations listed in this book was Aquila, a constellation in the northern sky that extends across the celestial equator. Also known as the “Eagle”, this constellation is one of the 88 constellations that is recognized today by the International Astronomical Union (IAU). It belongs to the Hercules family of constellations, which include Ara, Centaurus, Corona Australis, Corvus, Crater, Crux, Cygnus, Hercules, Hydra, Lupus, Lyra, Ophiuchus, Sagitta, Scutum, Serpens Caput, Serpens Cauda, Sextans, Triangulum Australe, and Vulpecula. Aquila takes it name from the Latin word for “Eagle”. According to classic Greek mythology, Aquila was the eagle that carried the thunderbolts of Zeus. He was also sent to retrieve the Trojan shepherd boy – Ganymede, whom Zeus desired – to become a wine-pourer for the gods. Aquila’s proximity to Aquarius, which represents Ganymede, is one of the reasons why the constellation is so-named. In another story, the eagle is found guarding the arrow of Eros (represented by the constellation Sagitta), which hit Zeus and made him love-struck. In yet another, Aquila represents Aphrodite disguised as an eagle, pretending to pursue Zeus in the form of a swan. This she did so that Zeus’ love interest, the goddess Nemesis, would give him shelter. 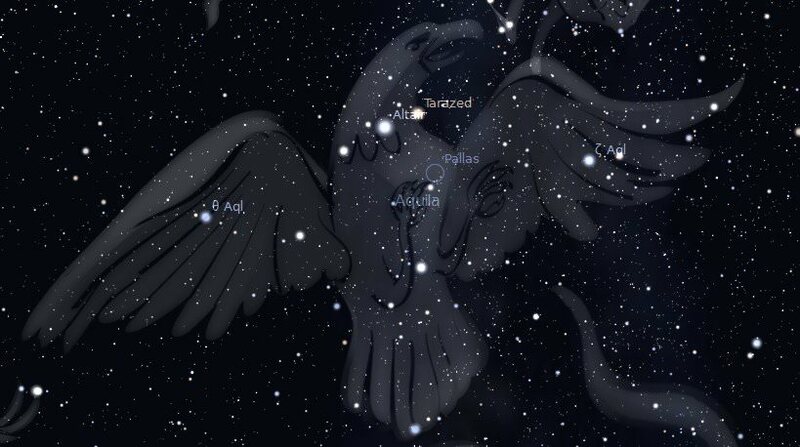 Zeus later placed the images of the eagle and the swan (the constellation Cygnus) among the stars to commemorate the event. Aquila may also represent one of the twelve labors of Hercules. Though it one of the 48 constellations included by Ptolemy in the Almagest, the first recorded mention of Aquila that still survives come from Eudoxus of Cnidus – a Greek astronomer and student of Plato’s during the 4th century BCE – and Aratus, the didactic poet who wrote of the constellations in the 3rd century BCE. It is also believed that the Greek version of the Aquila constellation is based on the Babylonian constellation of MUL.A.MUSHEN), which occupied the same spot in the northern sky. The constellation was also known as Vultur volans (the flying vulture) to the Romans, which is not to be confused with Vultur cadens – their name for Lyra. Ptolemny was also responsible for cataloging 19 stars in the Aquila constellation and the now obsolete constellation of Antinous. These stars are sometimes erroneously attributed to Tycho Brahe, who later catalogued the same stars, but identified 12 as belonging in Aquila and 7 in Antinous. Ultimately, it was 17th century Polish astronomer Johannes Hevelius who determined the 23 stars in Aquila and 19 in Antinous. Aquila’s alpha star – Altair, which is translated from the Arabic al-nasr al-tair (“flying eagle”) – is located 17 light-years from Earth. This star rotates very rapidly (286 km/s), which is what gives Altair it’s shape – i.e. flattened at the poles. Beta Aquilae (aka. Alshain) is a yellow-hued star of magnitude 3.7 is located 45 light-years from Earth. Its name comes from the Arabic phrase “shahin-i tarazu”, meaning “the balance”. Gamma Aquilae is an pranged-hued giant star of magnitude 2.7 which is located 460 light years away. It’s name, like Alshain, comes form the Arabic term for “the balance”. Whereas Altair is one of the three stars that form the Summer Triangle – an asterism that can be seen directly overhead at mid-northern latitudes in the summer – Alshain and Tarazed form the wings of the eagle. According to SEDS, two major novae have been observed in Aquila. The first one was in 389 AD and was recorded to be as bright as Venus. The other shone brighter than Altair, the brightest star in the Aquila constellation. Two major novae have been observed in Aquila – the first one being in 389 BCE that was recorded as being as bright as Venus – and the other in 1918 (Nova Aquilae 1918), which briefly shone brighter than Altair. The constellation is also home to several Deep Sky Objects. Foremost amongst these is NGC 6751, a planetary nebula that is also known as the Glowing Eye. The nebula is estimated to be around 0.8 light-years in diameter and is estimated to be roughly 6,500 light-years away from Earth. It was formed when a star collapsed and threw off its outer layer of gas several thousand years ago. The nebula was the subject of the winning picture in the 2009 Gemini School Astronomy Contest, in which Australian high school students competed to select an astronomical target to be imaged by the Gemini Observatory. The constellation of Aquila is easily recognized as a small cruciform configuration east of the Milky Way. For those using binoculars, those looking for Aquila should first look at Altair. It’s the twelfth brightest star in the sky. A groundbreaking study with the Palomar Testbed Interferometer revealed that Altair is not spherical, but is rather flattened at the poles due to its high rate of rotation. Synthetic aperture techniques with multiple optical telescopes have imaged this phenomenon. Located on 17 light years away from Earth, this Delta Scuti type variable spins completely on its axis in a matter of about 6 hours and 30 minutes. Now compare it to Gamma – Tarazed – which is about 460 light years from here. It is a giant star with a diameter of approximately half an AU. Now, here’s something you can study – Eta Aquilae. Eta is one of the brightest of the Cepheid variables, ranging from magnitude 4.1 to magnitude 5.3 every 7.2 days. It is a super giant star about 3400 times more luminous than the Sun, located 1200 light years from our solar system. For both binoculars and small telescopes, try double star 57 Aquilae (located about 15 degrees south or less than a handspan from Eta). This is a very cool matched pair of stars of equal 6th magnitude brightness separated by about 36 arc seconds. Check out R Aquilae, too. It’s a Mira-type variable. It takes about 300 days to go through its changes but at its peak it’s about 200 times brighter than our Sun. R is visible with the unaided eye at maximum brightness and its magnitude ranges from 5.5 to 12 every 284 days exactly. Now, get out the telescopes and let’s go for some binary stars. First, Beta Aquilae – Alschain. Located almost 45 light years away and shining at magnitude 3.7, you’ll find its disparate 12th-magnitude companion 12.8 arc seconds away. Now try Zeta Aquilae, a much more difficult double star located about 83 light years away. The primary star is a 3rd magnitude white dwarf and its companion is a disparate 12th-magnitude found 6.5 arc seconds from the primary. And then there’s Pi Aquilae, a double star easily resolved with a 6-inch telescope into its two components of magnitudes 6 and 7, separated by 1.4 arc seconds. More? Try 15 Aquilae. Star 15 is a yellow 5th-magnitude giant with a 7th-magnitude companion positioned 40 arc seconds away. It can easily be observed with small telescopes. If you’re looking for some great deep sky objects, why not try some Barnard Dark nebula? E.E. Barnard classed these great objects, and with just a little practice, you can learn to see “nothing”, too! Head about a degree and a half west of Gamma for B143 and B144. Here you will find a large patch of nothing that will stand away from the starry fields. It covers about a full degree of sky, so use a wide field eyepiece and low magnification. If you’re looking for something a bit brighter, let’s try some open clusters for the telescope. Find Zeta and go about five degrees southwest for NGC 6709. It’s a nice compressed star field of about 30 stars covering an average diameter of about 15 arc minutes. Located about 5 degrees west of Delta you’ll find NGC 6755, another small open cluster. At low magnification, it’s not very well resolved, but up the magnification and you’ll find about a dozen faint stars as your reward. For more information, check out the IAUs list of Constellations. and the Students for the Exploration and Development of Space page on Aquila and Constellation Families.